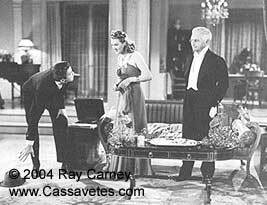 This page only contains excerpts and selected passages from Ray Carney's American Vision: The Films of Frank Capra. To obtain the book from which this discussion is excerpted, click here. 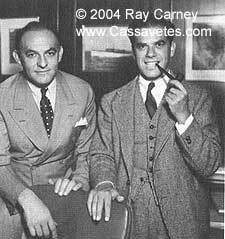 ...A number of important books and essays on Frank Capra's life and work have appeared during the past decade. They represent a wide range of viewpoints and approaches.... There obviously are many different Frank Capras and many different ways of approaching his movies. These studies come to diverse and even strikingly opposed conclusions about Capra's life and work–ranging from one critic's celebration of the philosophical depth of Capra's films, to another's attempt to reveal the filmmaker as an egotistical self-promoter.... Yet one closes each of the studies with the feeling that something is missing. Many of the qualities that make Capra's films most distinctive and important have not quite been captured. In the brief space available here, I want to argue a radical position: that academic film criticism will never do justice to Capra's work (or that of many other filmmakers) until it approaches it in an entirely new way. Until that day, however fine the nets Capra's critics weave, I would argue that they are doomed to watch their prey slip out of their grasp. I want to pose some extremely basic questions about the ways film criticism is done. One place to begin is to ask why American film criticism is devoted, almost without exception and certainly without ever reflecting on it as a special technique at all, to a "surface-depth" model of artistic expression. All of the scholarly commentators on Capra's work (and on that of most other directors) assume, seemingly without question, that the function of criticism is to move from relatively superficial and unimportant perceptual events (everything you actually hear and see on the screen) to a realm of profound, and invariably invisible or hidden, "deep" meanings. These commentators are critical Platonists. Their goal is to leave the phenomenal realm behind and move into a world of intellectual abstractions. As William James put it, they seek to dive behind the turbulent perceptual surfaces of experience and anchor themselves in unchanging conceptual depths. The most pervasive manifestation of this tendency is the inveterate symbolizing method American film criticism employs. (I call it inveterate because most critics seem to be unaware they are doing it.) Individual scenes, characters, images, objects, lighting patterns are regarded as being "metaphoric," or as "figuring" or "representing" abstract ideas. Cinematic events are translated into more general meanings. Practically any page of academic criticism about any of Capra's films from the past twenty years could be cited to illustrate the technique. In Mr. Smith Goes to Washington, for example, Jefferson Smith is said to be a symbol of the common man (or, for a religiously minded interpreter, of Christ). Clarissa Saunders is turned into a representative of a certain type of pre-World War II working woman. Various scenes in the film are said to figure general statements about power relations between the sexes or between different social groups. In short, Mr. Smith Goes to Washington becomes a modern Pilgrim's Progress, only with secular, social meanings in place of spiritual ones. The basic critical procedure is an act of metaphoric translation. The critic translates the characters, actions, words, and images into a series of abstract meanings, moving from sensory experiences to symbolic significances, from perceptions to conceptions, from the physical to the metaphysical, from the visible to the invisible, from the realm of the known to that of the secret. We are so used to this that it may seem inevitable to us that this is what criticism does. And indeed, there may be particular filmmakers whose works positively beg for symbolic/allegorical treatment. For example, Hitchcock's films are machines for abstraction. They deliberately hold us just above the surface of the phenomenal world and downplay physical realities. In place of sensory awareness, they clearly encourage the viewer to search for abstract relationships and secret meanings. Perhaps that is why Hitchcock has been such a darling of the critics; his films suit their interpretive methods perfectly. But in the case of Capra (and many other filmmakers) what American academic critics seem not to have recognized is that their one-style-fits-all critical procedure may do violence to the experience they attempt to characterize. It may betray the work it seeks to explain. Since abstractions by definition exist outside of time, they eliminate the process-aspect of experience. They push the pause button on life and art, translating flowing, changing perceptual events into static intellectual patterns. Movies move, but metaphoric generalizations stand still. Furthermore, abstract conceptions have a clarity and simplicity foreign to perceptual experience. They smooth its rough, uncertain edges, making what is sensorially noisy and emotionally fuzzy into something intellectually sharp and definite. The truth of conceptions is fundamentally different from the truth of perceptions. Conceptions represent the possibility of essential truth. The truth of the symbolists/allegorists goes to the heart of a scene, a shot, or a character, and offers a vision of complete, fundamental, enduring meaning. Perceptual truth is never like this. It is necessarily contingent and relative. It is always, to some extent, partial and provisional. Above all, by locating meaning in a realm beyond or behind actual sensory life and action, the symbolic method implicitly devalues the meaningfulness and importance of the phenomenal world. Is the temporal, sensory, emotional world we live in really so thin and empty as to need support from a stable, enduring intellectual world of meaning somewhere beyond it? Are mystery and complexity so absent from actual events that we must find them by looking behind the events? Must sermons always be hidden under stones; can't they–as Shakespeare apparently thought possible–be in them? This devaluation of the life of the body and the senses should give us especial pause when we are dealing with a filmmaker with such a Mediterranean relish for the feeling of lived experience as Capra. Any account of Capra's work that leaves out the sheer sensory gusto of the films (the shapes of bodies, the timbres of voices, the movements of figures through space, the thrill of the timing and pacing) cuts the heart out of his work. One might say that this criticism is just too Protestant–too sternly cognitive, too interested in abstract typologies, too allegorically disembodied–to do justice to Capra's earthy, Catholic, Sicilian sensibility. One needn't appeal to Capra's ethnic background to see this. The films themselves mount powerful anti-symbolic, anti-allegorical arguments. Characters like Cedar, Norton, Taylor, and Potter all function as practitioners of abstracting forms of understanding and relationship. They attempt to attach static, symbolic, and ultimately life-denying meanings to events and individuals. Capra clearly does not endorse their efforts. As I argue in my chapter on It's A Wonderful Life, Capra's work is so opposed to the creation of symbolic truths that even an event or a word that a well-intentioned character wants to treat as a symbol is shown to resist being stabilized this way. With the noblest intentions in the world, Mary Hatch attempts to create enduring symbols of her faith in George's vision with her "George lassos the moon" needlepoint. The only problem (which is, in Capra's view, of course no problem at all, but a cause for celebration) is that her symbols won't stand still the way she wants them to. Like the Granville Place, and like most of the other important events and objects in the film, "lasso" and "moon" continually shift and change their meaning. At George's darkest hour, they completely reverse their original meanings: the lasso of his youth becomes a noose around his neck, and the moon transforms itself from an object of romance into the name of an unromantic dive in Pottersville, the Blue Moon Bar. Capra wants us to see that life moves out from under the symbols we would nail it down with–even our most idealistic and spiritually exalted symbols. Not even meanings made with love can stop life's motion. The most common symbolic method used in recent American film criticism is a particular kind of allegorical reading that has come to be identified with cultural studies or ideological criticism. In this mode of interpretation, the characters, events, and images in a movie are metaphorically translated into a series of sociological generalizations. In Capra's case, this might involve using his films to discuss social conditions during the Depression, power relations between men and women, or other aspects of pre- and post-War American society. Our age has witnessed the triumph of social science methods and forms of understanding in virtually all other areas of human affairs, so it should come as no surprise that film criticism (and indeed most criticism of other arts as well) has attempted to turn itself into a branch of the social sciences. Because of their manifest engagement with so many of the social issues of their day, Capra's films have yielded an unusually rich harvest of generalizations to cultural studies critics. The problem these critics have failed to have grappled with, however, is that the most interesting and important aspects of the works they deal with drop out of their analysis. Content is a very, very tiny part of a work of art. The realistic, representational content of virtually any art work can be translated into a series of sociological generalizations, but what will be lost in the translation is the work of art: everything that makes the poem, painting, or film different from a political pamphlet or the CBS Evening News. Capra's films document a variety of mid-twentieth-century ideological positions, just as Sargent's portraits document a variety of late-nineteenth century styles of clothing. But so what? Capra's films are no more reducible to the ideological positions they include than Sargent's paintings are reducible to fashion plates. The interest of both artists' work begins where such realms of understanding end. In fact, works of art aren't even very reliable sources for ideological generalizations. Why would you want to base your conclusions on such odd and limited sources of information? It would be like using Fidelio to study nineteenth-century penology, or Monet's paintings to study botany. The result would be bad history or science and worse criticism. But this is not to put it strongly enough. I would argue that Capra's films (and most other interesting works of art) imagine experience in ways not only different from, but fundamentally opposed to the forms of knowing that cultural studies approaches are devoted to. I have spoken and written about this subject at length on many previous occasions, so I will confine myself to one particular problem that arises when Capra's work is appropriated by cultural studies critics: namely, the loss of the individual. Ideological readings of Capra's works are premised on generic understandings of experience. Capra's films appeal to cultural studies critics because they can be treated generically at three different levels. First, the creation of the films is treated as being the product of general cultural structures and forces. The characters and events in the films are treated as representing these structures and forces. Second, the characters and events in the films are treated as representing abstract structures and forces. And third, the viewers of the films are understood to be approaching them in accordance with generic cultural structures and forces. At each level–that of the creator, the representation, and the viewer–individuals are imagined to exist only insofar as they embody group relationships and categorical understandings. Experience is understood systematically and impersonally. In this sense, there are no individuals in cultural studies. The system swallows up its members. There is no space left in which individuals can move freely. But this is precisely counter to the facts–not only the facts of the so-called production and consumption of Capra's films, but, more important, the facts of life. What ideological analyses overlook is that, although in a very weak sense individuals do share certain generic qualities (sexual, racial, or class attributes), these qualities account only for the most superficial aspects of our identities. The most important part of us is what belongs to us alone. The general name for that is our consciousness–which is why personal consciousness is the one part of us that cultural studies criticism can say nothing about. The mutability, creativity, and unpredictability of our individual beliefs, feelings, and fantasies define a private, personal space into which ideological analysis cannot reach. For cultural studies, our identities are skin-deep. There are no insides to ideological understandings of experience, which is why in cultural studies when relationships between specific individuals are mentioned, the relations focused on are purely external, coercive ones of power, status, and dominance, rather than internal, volitional relations of love, hope, or imagination. The imagination is erased. Privacy disappears. The secrecy, the mystery of selfhood is denied. It is particularly ironic that Capra's work should be read in this way, since in film after film, he affirmed the uniqueness of individual identity and consciousness. What else is It's a Wonderful Life about? The cultural studies interpreters of his work have failed to learn the most basic lessons his films offer. They have not seen that consciousness can utterly escape institutional surveillance or control, and that personality can avoid being limited by the cultural structures within which it is forced to express itself. This the very subject of the Deeds-Smith-Doe trilogy. Even if the critics had not already understand that something could be resistant to the circumscriptions of social structures and material definitions, these works should have shown it to them. Again and again, from his early films Forbidden and The Bitter Tea of General Yen to later ones such as It's a Wonderful Life and Pocketful of Miracles, Capra found ways for his characters to express mysterious, personal energies, realms of interiority that generic understandings and group pressures could not touch. It is in the distinctiveness, eccentricity, and unpredictability of the acting that Capra most obviously registers these free movements of consciousness. Not surprisingly, considering the predilections of most of his critics, the actor is the missing person in most treatments of Capra's films. Great acting captures just the sort of fluttering, flowing, and ideologically indeterminate energies that cultural studies understandings of experience can't deal with. Good acting in its essence is non-generic. It expresses shimmering surges of consciousness and mercurial flickers of feeling that elude expressive systematization, symbolic understanding, or social control. 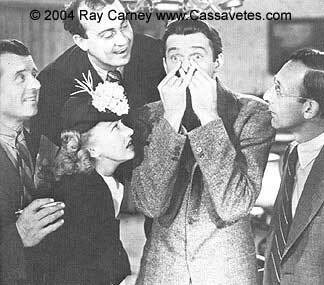 For a crash course in what that means, a viewer only has to pay careful attention to Jimmy Stewart's charged gasps, glances, stutterings, stammerings, stares, and silences in Mr. Smith Goes to Washington and It's a Wonderful Life. As I shouldn't need to explain by this point, in my study of Capra I go on no quest for "symbols," "metaphors," or "figurations." Nor do I read cultural generalizations out of the films or treat their characters and situations as generic expressions of social conditions. On the contrary, I emphasize the personal, private states of subjectivity the characters embody, and Iattempt to be faithful to the fluxional imaginative energies Capra's work seeks to liberate. As I have been suggesting, one of the most interesting things about Capra's work is that he has, in fact, anticipated his critics, for, in the films themselves, he has created characters who function as critics should function, as well as characters who embody the worst tendencies of contemporary criticism. The one set of figures (represented by Tom Dixon, Lulu Smith, General Yen, Jefferson Smith, Longfellow Deeds, and George Bailey) honors the uniqueness of personal consciousness and affirms the power of the individual to escape repressive systems of understanding. The other set (represented by Cedar, Taylor, Norton, and Potter, among others) is devoted to forcing various kinds of metaphoric, symbolic, or allegorical interpretations onto experience, robbing life of its mystery, and denying individuality and imaginative freedom to others. Endeavoring to endow events with grand cultural and social meanings, Norton and his kind would systematize all of life into a series of impersonal relationships and understandings, and snuff out the energies they can't control. Long before cultural studies forms of understanding swept through our universities, these films demonstrated their fallaciousness. They illustrated how tendentious sociological interpretations drain life of its idiosyncrasy and uniqueness. They showed how systematic understandings deny the magical unpredictability and wondrous spontaneity of actual lived experience. These films show us something else as well. Lest we get sentimental about our contemporary critical and cultural plight, Capra reminds us that the situation today is no more dire than it was in his own day. And it is not all that different. Limiting understandings have always waged war against the free energies of consciousness. These films are not antiques from a bygone era. They are for us, here and now. To read more about fashions in criticism and critical fashions, see "Journalism and Criticism" in Carney on Culture, "Day of Wrath: A Parable for Critics," in the Carl Dreyer section, "Sargent and Criticism" and "Eakins and Criticism" in the Paintings section, and "Skepticism and Faith," Irony and Truth," "Looking without Seeing," and other pieces in the Academic Animadversions section.